I need to make room! A whole lotta handspuns are now up on my destashing page at Flickr – click the photo to see. Prices are in USD and DO NOT include shipping. I take Paypal, including credit cards. BUT, I will refund if shipping turns out to be cheaper than anticipated. Email me at cosmicpluto at gmail dot com to order. Please do not send a payment until I email you back! 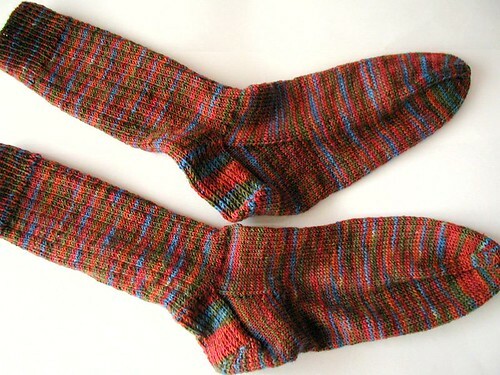 I finished the Tuscany (Lorna’s Laces) socks a loooong time ago but never blogged them! They’re just basic socks, 68 sts on 2mm needles, 3×1 ribbing and normal heel flap. I made them for the boyfriend’s brother, who wore them to an important interview…and got the job! The main colours are the light pink and dark pink/red. I was a bit disappointed with the light pink colour at first but I think it’ll all work out. Some swatching is in order, of course, and I can always just supplement with other colours if needed. I’ll be having a BIG handspun destashing sale tomorrow. Stay tuned! I had a really nice time and there was lots of stuff I liked. I ended up buying a really cute top and skirt from one seller, and I just looooved their other skirts – but they were a bit too pricey for me (about $150!). The skirt was a large and the top an extra small, go figure. I also bought a whole bunch of eatables! Blueberry balsamic (the same kind you got last year erin), maple mustard (had to avenge the Rhinebeck mustard), very nice red wine vinegar, maple jelly (very cool), marmalade, chocolate covered blueberries, cherries, and raspberries, and a garlic bread dipper (I think it would be quite nice on pasta). Mmmmmm, sampling. I realized afterwards that I’d wanted to get this onion marmalade but forgot. Probably better that way. There was a lot of very nice glass jewelery that I liked, but I don’t think I’m going to be able to go back this weekend (and we didn’t get a reentry thingy either, so I’d have to pay). The whole thing was definitely inspiring, and made it feel like spring to me for some reason, maybe all the shiny new things. I think some Etsy jewelery shopping is definitely in order! Any suggestions? It’s Lara by Debbie Bliss, in Alpaca Silk from elann when they had it awhile ago – very nice colour, extremely luxurious yarn, and very fast knit! That’s still about the place I am now, having taken some time away from it for new obsessions (more on that later), but I’m more than halfway done. 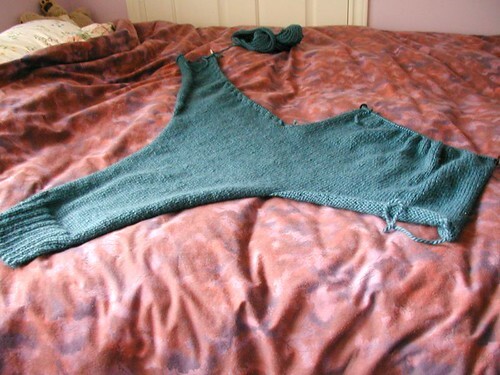 I am concerned about wear, though – I know it’s not going to wear well and it’s already fuzzing a bit. D’oh. Good thing I have a good sweater shaver thing. P.S. 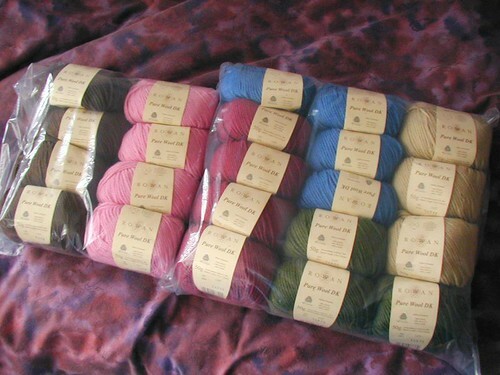 No new yarn until the Frolic diet isn’t going so well – there’s so much stuff at the store that I want! More organic wool/cotton (I LOVE this yarn) and a beautiful new handdyed merino with fabulous yardage from Dreams in Color. Argh!